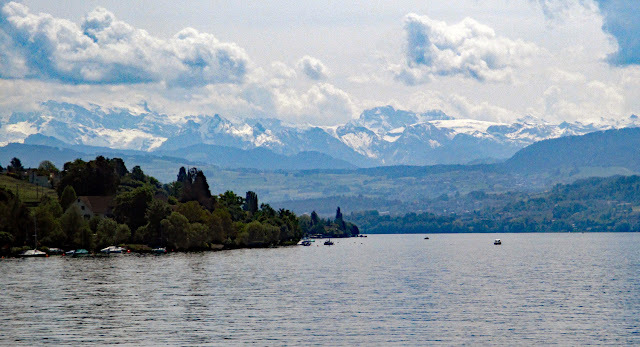 My latest European adventure began in late May of this year (2016), when I landed in Zurich, in the thoroughly German part of Switzerland (vs the French and Italian areas). 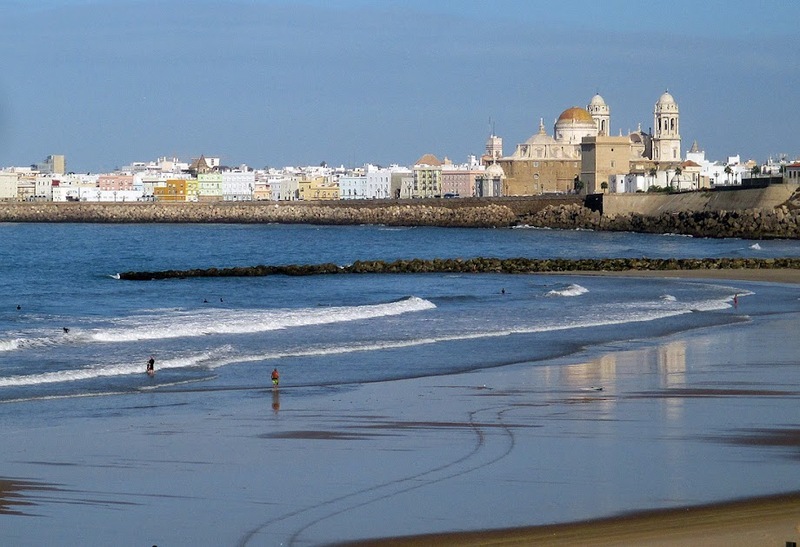 This post focuses on that city, one I find not a tourist heaven perhaps, but highly satisfactory. In fact had I the money and permission (I assure you I have neither) I could find it in my heart to remain there. It is my third visit. Fourth if you count a transfer of trains in the spring of 1999, when all I saw of Zurich occurred on a brief stepping out from the huge and wonderful rail station into the rain - and stepping quickly back in. 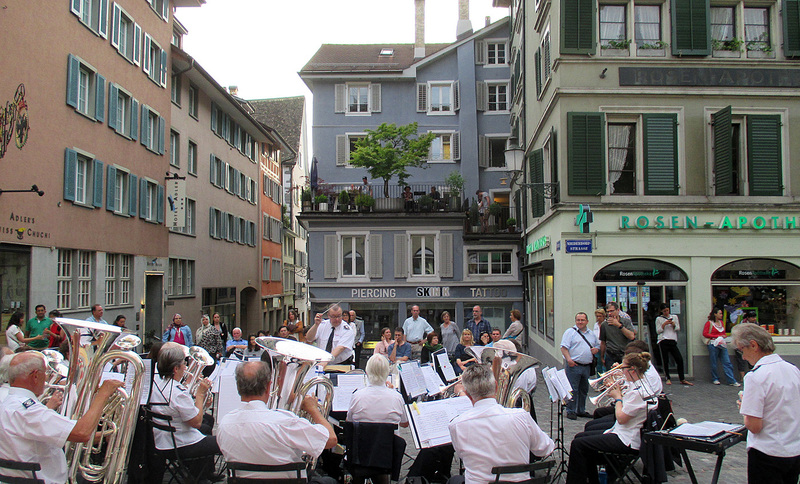 My first visit happened in the middle of a mostly German trip that started and ended in Frankfurt, but dipped down into Basel, Bern and Luzern into the wonderful Lauterbrunnen Valley and then up to Zurich before returning to Germany. On that journey Zurich was the last major city of four Swiss towns that I'd visited, and while not as scenic or beautiful as Bern or Luzern but MUCH nicer than Basel, I really discovered it. A very nice place! I returned more recently, and took an organized day tour from Zurich to the hinterlands, touring a pretty city up the lake called Rapperswil, touching briefly (45 minutes to 1 hour tops) in Liechtenstein, and spending a bit of time in the land where the real-life Heidi lived. 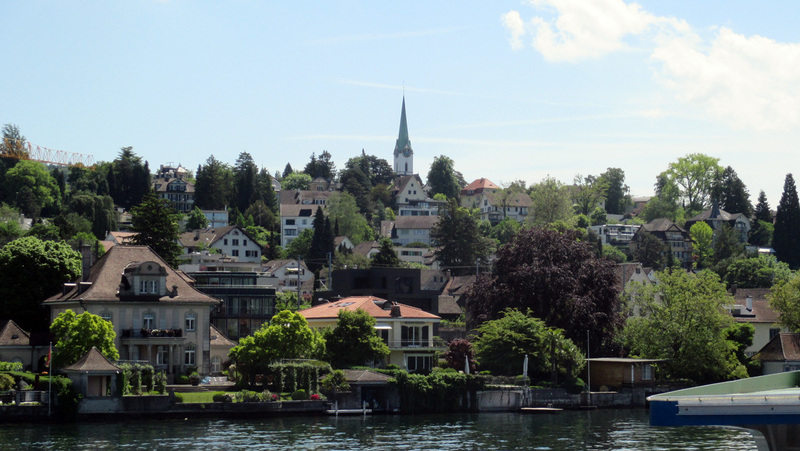 On that occasion I also had time to stroll Zurich and to confirm my suspicion that it is eminently livable - given as above the opportunity and the money. 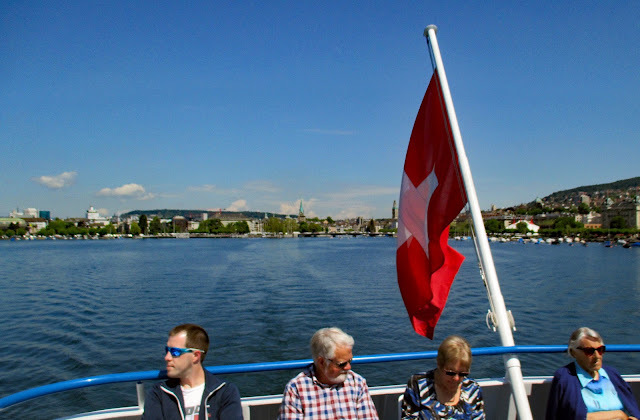 On my MOST recent European exploration (late May - early June 2016) I had only one short jet-lagged day to spend in Zurich and found my way around very easily - a good feeling, especially in as I was in a state of exhaustion. I thought I'd have to keep myself awake for several hours before checking into my hotel, but as luck and Swiss efficiency had it, I was allowed into my room at just after 10 am, immediately on my arrival in the city. Instead of snoozing, however, I opted to spend at least a few hours out and about before sleeping off the trans-Atlantic flight. I strolled along the Limmat river to where it empties into Zurichsee, or Lake Zurich. I decided to take a 90 minute cruise, the Short Roundtrip cruise, run by the company that organizes many outings on the lake. This cruise takes passengers on a journey only partway up the lake, stopping briefly at several suburban piers, then heads back stopping again at similar piers on the opposite side of the lake before dropping us back in the city. Cruising out of Zurich on the "Short Round Trip"
Lake Zurich is not as dramatic as Lac Leman, which begins in Geneva and continues on to Lausanne and Montreux, but Zurich's lake is like its town center - charming, likable, satisfying, especially so on a sunny day, which, fortunately, it was. We pulled out on a calm lake and headed towards our first stop. The air was so fresh! Just what I needed to help overcome the jet lag. Much of the shore on either side rises up small hills, suburb after suburb of Zurich, and above the houses mostly tree-filled higher elevations. Behind all of this, in the distance, lay real mountains, Alps or their ilk, which at first resemble a heavy mass of clouds on the horizon, then gradually appear as mountain peaks with clouds just above them, interlocked in a sense. This much I'd seen on an earlier trip when it was even more clear, and found myself agog! The boat took me closer and closer to them, and I was able to photograph the mountains much better than I had the time before. As the clouds rise over them and the sun comes in and out, the mountains change, not much mind you, but the shifting view was very satisfactory to me. I wonder how they must seem to the average denizen of Zurich? Mediocre probably, not so thrilling as "usual." To me they were as welcoming as the sea breeze and fresh air, which I gulped in as I gazed at the scenery. After a stop or four on the left side of the lake (as we left the city behind) we turned back towards Zurich and headed to and through what seemed the slightly seedier side of the lake, at some of the piers men who seemed to be unemployed, loud and unhappy (at least so I read the scene). Lovely houses, similar to those on the other bank and rising up hillsides kept the return portion of the cruise quite pleasant, though I began to feel myself dozing off (a bit too much fresh air?). I suddenly realized two things: I was very hungry, and I was very very sleepy. Soon enough we were back on the shore in the city. 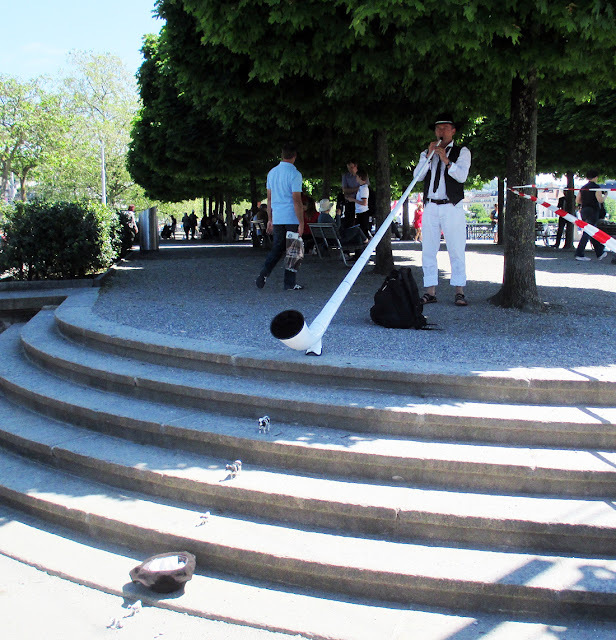 Almost immediately a very brief encounter ensued, with a fellow serenading me with a huge alpine horn, near the piers on a rise in a park several steps up from the sidewalk. The musician had quite cleverly placed a tiny toy cow on each of these steps, the first at the lowest edge of his horn, then down the steps to his hat, in which there was a bit of money. I added to it and was thanked, more or less, by a wee trill in his tune! As I walked away chuckling I heard more trills - he was having a good day it seemed. I walked through the old town heading towards my hotel and searching for sustenance. 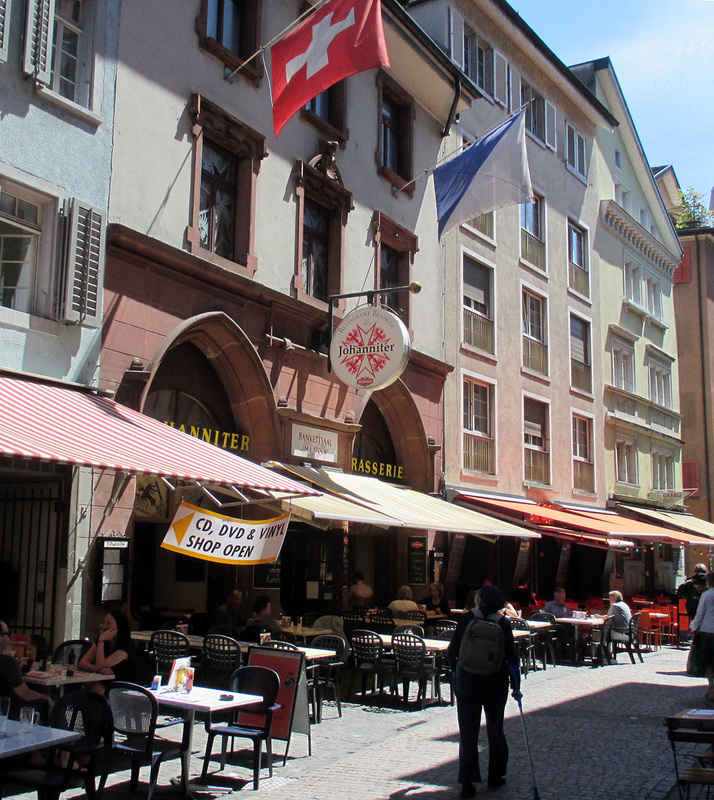 I decided on a Swiss-style restaurant/gasthaus where I sat just inside open doors. The outside area under the awning was already packed with people, easy to understand on such a lovely day. Despite a sullen waiter and a misunderstanding about what kind of beer I wanted, followed by a misunderstanding about the food I wanted, I had a wonderful if much too filling meal. 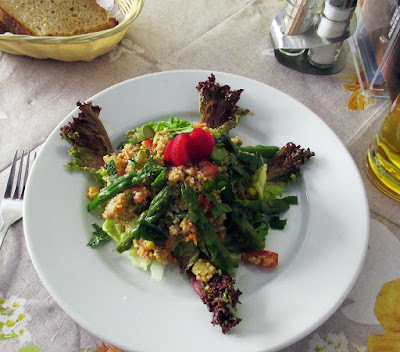 It began healthily enough with a Swiss lager and a delicious salad featuring very fresh "spargel" - asparagus - which was in season. 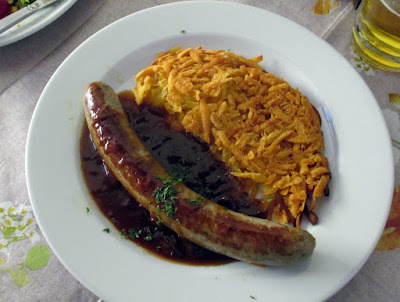 But I had also ordered wurst - and WHAT wurst! A gigantic sample accompanied by rosti, a form of fried potatoes. Too much but delicious. From there it was only a few steps to my hotel. Once there I fell into a deep sleep which lasted three hours. I took one more walk around dusk, and was treated to a band concert. The players were more enthused than excellent, but it was great fun, in the heart of the old town and very near my hotel. The next morning, having been well fed at breakfast, I caught my train and about 4 hours later stepped off in northern Italy - but that's another story!